Three cattle mutilations discovered in southern Colorado between March 8 and March 21, 2009. 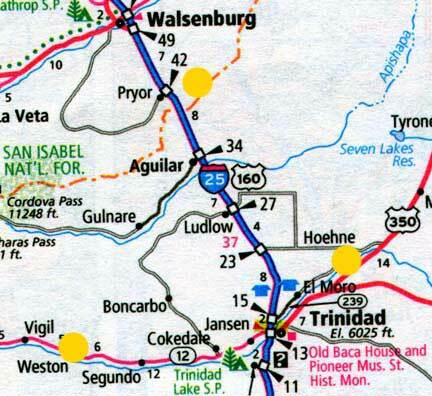 The three sites form a triangle (yellow circles) on the map starting with Weston about a half-hour west of Trinidad, which was the 28-year-old cow found March 8, and probably killed on night of March 6, 2009, because she was seen alive March 6. Hoehne is about 15 miles northeast of Trinidad, where 1-week-old calf was found eviscerated on morning of Tuesday, March 17, 2009, and known to be alive Monday afternoon, March 16, 2009. Third mutilation, a ranch about 12.5 miles southeast of Walsenburg (20 miles northwest of Hoehne) where 2.5-year-old heifer found Saturday morning, March 21, after giving birth to male calf Friday night, March 20. 2.5-year-old English Angus and French Gelbvieh heifer crossbreed gave birth to calf Friday, March 20, 2009, and was found dead under juniper tree with udder removed without blood or milk fluids visible next morning, in Walsenburg, Colorado. Image Sunday morning, March 22, 2009 © by Chuck Zukowski. March 27, 2009 Walsenburg, Colorado - Jim Garren is 70-years-old and retired from his CPA profession to full time ranching since 1993 on three ranches - two in southern Colorado and one in Missouri. One of his Colorado ranches is twelve and a half miles southeast of Walsenburg and only about twenty miles from Tom Miller's ranch in Hoehne where the 1-week-old calf was found bloodlessly eviscerated on March 17, 2009. Next PostNext European Honey Bee Decline Continues While Aggressive Africanized Honey Bees Attack in Southern U. S.